The aerospace grouping and the CIMA group of the University of Vigo are developing a new satellite that will detect fires autonomously. This is a pioneering project, which is being developed in collaboration with the University of Porto and the Laas-Cnrs research center in Toulouse (France) and with the financial support of the European Union. Fire-Rs, as the project is called, consists of the installation of infrared sensors in the mountains, so they detect the existence of any kind of fire: “An alarm is automatically generated. This alarm contains information about the fire and weather conditions, ie wind and its direction and speed. It also offers information about the position of the fire. “Once this alarm is generated, it is transmitted to the satellite and it automatically relays the information to a control center. It notifies to a fleet of drones, which move to the site to make a second supervisión that will offer a much more detailed analysis of what is happening:” They have thermal cameras on board so they are able to detect the exact extent of the fire and where is the main focus . Also if there are hazards around the fire, if there are houses, roads, camping areas …, and local wind conditions. 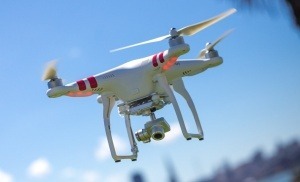 Drones incorporate transmitters that will extract additional information from infrared sensors and communicate with the satellite to be able to receive data in real time. One of the main achievements of this project is undoubtedly the autonomous detection of fire. Could this awesome techonlogy be applied to urban fires? Automatic fire detection is key to avoiding the high number of deaths that we have every year. In addition, if we mix it with a good fire protection system, the consequences of the fires will be reduced.